Tint Magic Window Tinting use computer cut window tinting software to pre-cut window films before placing it on glass. 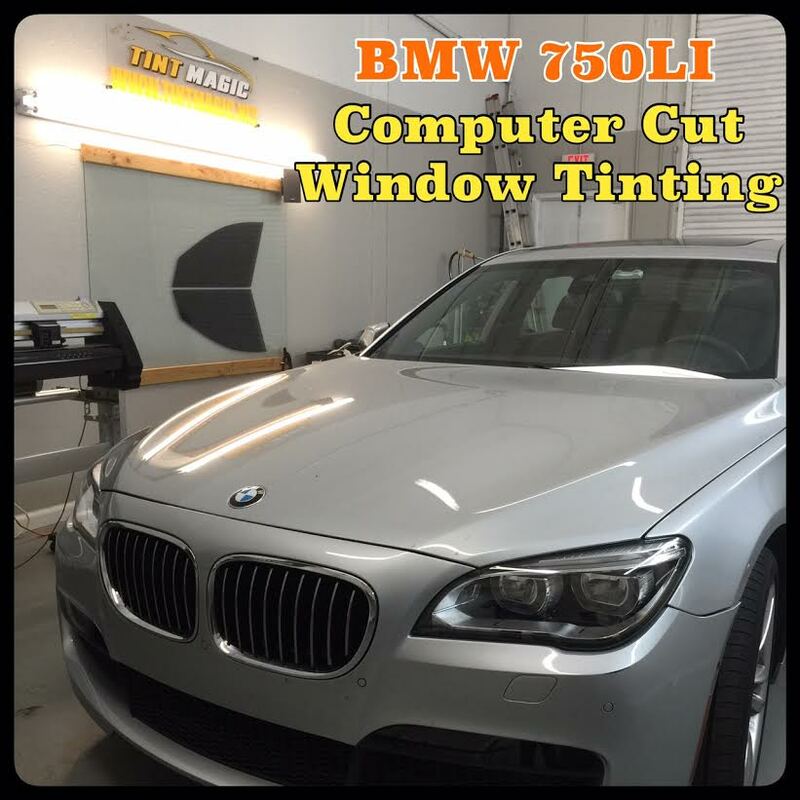 We have installed 18% Carbon window film all over around BMW 750LI. Always more limo than sports sedan, the BMW 750LI burnishes both sides of its personality with the all-new sixth generation, which arrives this fall as a 2016 model. The new 7 slims down thanks to a new platform that includes structural carbon-fiber elements, while at the same time turning up the luxury quotient and the techno wizardry. It will take a sharp-eyed observer, however, to identify the new, sixth-generation 7-series once the car starts gliding off dealer lots. Dimensionally very close to its predecessor, the 7-series in its latest iteration grows just over an inch in length, while its width and height remain largely unchanged. Largely unchanged could also describe the styling, which is at most a measured evolution. The car’s shoulder-line crease now continues forward through the headlamp cluster—with its familiar LED eyebrow—and into the twin-kidney grille (which hides active shutters to aid fuel economy), while in back it extends rearward into the more complexly shaped taillamps. There’s also a new, hockey-stick-shaped design element along the lower body sides. The net effect is to take another baby step away from the leaden, dumpling-like form language introduced with the Bangle-era 7 series of 2002. Beneath the conservative exterior, however, the new 7-series platform contains some major changes. What BMW is calling its “Carbon Core” structure (with a badge to that effect on the B-pillar) is in fact a mix of carbon-reinforced plastic, aluminum, and high-strength steel. The carbon fiber is used in key areas such as the A-, B-, and C-pillars, the windshield header, and the transmission tunnel. Molded-plastic front fenders and an aluminum trunk and door skins shave additional weight. The company says that as much as 190 pounds have been trimmed, with unsprung mass down by 15 percent—the weight that remains is balanced nearly equally among the front and rear tires.